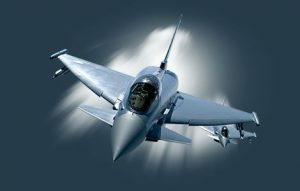 Qatar is to purchase from the UK 24 British Typhoon fighter jets, under a ‘statement of intent’ signed Sunday between the Qatari Minister of Defense Khalid bin Mohammed al-Attiyah and his British counterpart Michael Fallon. The delivery date has not been announced. Fallon hailed the agreement as heralding a deeper cooperation between the two countries. “This will be the first major defense contract with Qatar, one of the UK’s strategic partners,” Fallon said. London is also one of Saudi Arabia’s arm and military equipment suppliers. Saudi Arabia, the United Arab Emirates (UAE), Bahrain plus Egypt have severed ties with Qatar cutting off air, sea and ground links. The Quartet accuses Qatar of supporting terrorism. They have denied allegations that they considered military action against Qatar, which has rejected the accusation and tossed conditions for the normalization of ties. Last June, at the onset of the Gulf crisis, Qatar signed an arms deal with the US defense department to buy F-15 jets, to the tune of $12 billion.